These 2 great properties were Listed and SOLD in less than a week!! Let me know how I can help you get yours SOLD!!! The housing market is booming right now, and as more Ohioans buy and sell property, it is important to protect yourself from illegal practices that you may not even know are unlawful. Two common areas are unlicensed real estate activity and unlicensed property management. One of the first areas to be aware of is seminars that teach unlicensed real estate activity. These seminars provide instructions on wholesaling and option purchase contracts. Language included in these schemes include: “tying up the real property,” putting the house in contract until a buyer is found and placing the home in contract for the purpose of re-selling the property. The seminar instructors tell attendees that they can place a property in contract or an option to purchase, at which time the attendee can then market and re-sell the property for a profit. The instructors also advise attendees how to bring buyers and sellers together through the use of an “assignable contract” for a fee. It is the position of the Ohio Division of Real Estate & Professional Licensing that, pursuant to Ohio law, an Ohio real estate license is required for this practice. There are legal ways to wholesale property in Ohio, but the seminars typically generalize information that may or may not be correct in all 50 states. For example, licensure requirements or the potential requirement for a license is not conveyed to attendees of these seminars, presentations or coaching programs. What can happen in these situations is a buyer (buyer #1) will put an offer on a home, but put little to no money down on the property. Buyer #1 then lines up another buyer (buyer #2). Buyer #2 actually pays for the home on closing day, and buyer #1 walks away with the difference. The seller may never be aware that a buyer was willing to pay more money for their property. If the home is sold at a loss, the seller could be expected to pay on the loss as taxable income. Another issue to be aware of is unlicensed property management. Only a licensed real estate broker can engage in property management for another and for a fee. If you are hiring someone to manage the real estate you own, make sure the individual or entity is an actively licensed real estate agent. The licensee must run all property management services through the licensed real estate company where their license is affiliated. This can include renting or selling your property or negotiating leases. Consumers should check with the Division to see if the individual he/she is working with is licensed before engaging in any contract or agreement. Licensees or anyone interested in getting involved with the real estate profession should be familiar with the requirements for licensure and can check with the Division if any questions arise. Finally, if you suspect unlicensed activity is occurring, please report it to the Division. You can do all of these things by calling (614) 466-4100. 3729 Alaska Court - Multi Family FOR SALE!! 2-2 bedroom spacious units on a Quiet, Dead-End Street. Off street parking, including a garage and a nice yard!! ERA REAL Solutions Realty works with sellers, buyers, developers and investors all throughout Cincinnati, Columbus and all of Ohio. 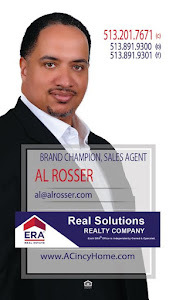 ERA REAL Solutions Realty. Equal Housing Opportunity. Serving the Greater Cincinnati Area as a Licensed Real Estate Agent, since 2001. Also, an Adjunct Real Estate Instructor for Hondros College. Interested in a Career in Real Estate?!? ACincyHome - Find your New Home! ACincyRental - Find your New Apartment!